Crispy, sour, salty, sweet: you want it all when you're pregnant. These scrumptious recipes offer new ways to satisfy your craziest pregnancy cravings. One moment you're hankering for salty potato chips, and the next you're tearing into a juicy orange. A big ol' steak has replaced your pre-pregnancy vegetarian suppers, and your in-laws now stock your favorite brand of chocolate chip ice cream. What explains a pregnant woman's cravings? Experts agree that impulses for certain foods stem from increased hormone production. A pregnant woman generates more than 30 different hormones, which in turn can lower her blood sugar (and lead to nausea), increase her metabolism (and lead to hunger), and sharpen her sense of smell and taste (which can trigger at various times morning sickness, food cravings or aversions). Indeed, during the first trimester when hormones increase dramatically, many women seek foods to alleviate nausea. "In the beginning of each pregnancy, whenever I felt queasy, I craved white foods," says Jessica Bennett, a mother of two in New York. "I ate bananas, chicken and ice cream. They made my stomach feel really good," she says. "And milk—I can't even describe how good it tasted going down." Miriam Erick, M.S., R.D., senior dietitian manager at Brigham and Women's Hospital in Boston and author of No More Morning Sickness, finds women with morning sickness (which, as you probably know, can occur any time of day) generally feel better when they nourish their bodies. "Often it's a hunger or hydration issue," she says, and goes on to explain that women crave crackers and potato chips because they're dry and help eliminate excess saliva. "Watermelon is also popular because it's sweet, crunchy, cold and wet," she adds. Since many women go to such lengths to satisfy a particular craving, one has to wonder if some of these impulses for certain foods signal nutritional deficiencies. According to Erick, however, cravings have not been studied enough to determine their cause. "Even when I was sick," testifies Kyra Kuhn, a new mother in California, "I craved fresh apples. They were crisp and hydrating," she says. "I also ate potato chips. I knew they were fattening, but I craved the salt. Besides that, I also ate a lot of rice pudding because it was creamy, smooth and easy to eat." Throughout the second and third trimesters, when nausea often dissipates, many women desire foods to satisfy cravings for specific tastes. Erick has found that fruits such as apples, oranges and lemons are the most-often craved foods, followed by pickled items, raw cereals, spices, licorice and tomatoes. Traditionally, cheese and kippers also ranked high, especially among European women. For many expectant mothers, the hunt for a particular taste becomes an obsession. "Near the end of my pregnancy, I had a serious citrus craving," says Sarah Moore, a San Francisco advertising executive. "I would eat three or more oranges a day. And, if I didn't have any oranges, I would drink a fruit smoothie, driving ridiculous distances across the city just to buy one." For most of us, however, the object of desire usually is a bag of chips or a bowl of ice cream, and concerns over fat and calories fall by the wayside. Keeping nutritious snacks handy, however, might help divert your attention from those choices. Select whole grains, low-fat dairy products and lean protein whenever possible, and stock up on fruits and vegetables. To limit fat calories, use low-fat cooking techniques, such as roasting or steaming. If you're stumped as to what to prepare, take a look at the following recipes. Crunchy maple granola may be the perfect snack to turn to when your blood sugar dips. To quickly get a nutritious dinner on the table, you can prepare the Spicy Tomato Pita Pizzas in no time. "Use moderation when it comes to dietary fat," advises Nancy Clark, M.S., R.D., author of Nancy Clark's Sports Nutrition Guidebook, "and realize you can have a good diet without being perfect." This is a smart idea to keep in mind, even after the baby arrives. The dishes we feature below will satisfy your cravings while helping to keep calories and fat in check. Candied Ginger Watermelon Cup Serves 4 The ginger in this dish is famous for settling queasy tummies. In a medium bowl, stir together first three ingredients. Add watermelon balls and toss to coat. Serve cold. Nutritional information per serving (1 cup): 79 calories, 7 percent fat (.7 grams), 88 percent carbohydrate, 5 percent protein, 13 milligrams calcium, .4 milligrams iron, 4 micrograms folic acid. Lemony Mediterranean Roast Chicken Serves 8, with leftovers This moist lemony chicken tastes wonderful with whole new potatoes added to the roasting pan. Preheat oven to 400°. Rinse chicken, pat dry with paper towels, and place in a large roasting pan. Cut lemons in half and squeeze juice over chicken; tuck two halves into cavity of bird. Rinse frozen artichoke hearts under hot water to separate; place around chicken. Add broth to pan and season vegetables with oregano and pepper. Bake the chicken for 60 to 70 minutes, or until juices run clear when thigh is pricked with a sharp knife. Nutritional information per serving (3 ounces): 244 calories, 29 percent fat (8 grams), 24 percent carbohydrate, 47 percent protein, 47 milligrams calcium, 2 milligrams iron, 189 micrograms folic acid. 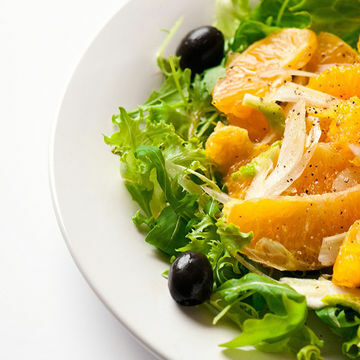 Crisp and Juicy Orange Fennel Salad Serves 4 This refreshing Sicilian-style salad is filled with licorice-flavored fennel and sweet juicy citrus. Spicy arugula is another highly craved food. Tear arugula into bite-size pieces and arrange on four plates. Sprinkle fennel on top. Split orange in half, lengthwise. Slice, across the width, into thin half moons and scatter over fennel. In a small bowl, whisk together vinegar, oil and mustard. Drizzle over salads and season with pepper to taste. Nutritional information per serving (1 1/2 cups): 57 calories, 38 percent fat (2.6 grams), 53 percent carbohydrate, 9 percent protein, 62 milligrams calcium, .4 milligrams iron, 26 micrograms folic acid. Sweet and Salty Roasted Potato Spears Serves 4 These chewy baked sweet potato spears hit the spot when you're longing for fried food yet fill many nutritional needs. Preheat oven to 375°. Coat two baking sheets with cooking spray. Slice the potatoes in half, across the width. Cutting lengthwise, slice each half into four spears. Place potatoes in a bowl and toss with remaining ingredients. Transfer to baking sheets and roast for 45 to 50 minutes, turning occasionally, until golden. Nutritional information per serving (8 spears): 196 calories, 11 percent fat (2.5 grams), 83 percent carbohydrate, 6 percent protein, 51 milligrams calcium, .8 milligrams iron, 39 micrograms folic acid. Spicy Tomato Pita Pizzas Serves 6 When you can't take your eye off a big pizza pie, try making these gooey cheese-laced pita rounds. Preheat oven to 400°. Place first four ingredients in a food processor and pulse until blended, but still chunky. Place pitas on a baking sheet and spread with tomato mixture. Sprinkle with mozzarella and bake until cheese has melted, about 8 minutes. Nutritional information per serving: 237 calories, 13 percent fat (3.3 grams), 70 percent carbohydrate, 17 percent protein, 153 milligrams calcium, 2.5 milligrams iron, 21 micrograms folic acid. Crunchy Maple Granola Makes 5 cups Nibble on this low-fat granola when you need something crunchy. Preheat oven to 325°. In a small saucepan, bring syrup and salt to a boil. Remove from heat. Place grains and almonds in a large bowl and toss with warm syrup. Scatter granola evenly on a baking sheet and bake, stirring occasionally, for 20 minutes, or until crisp and golden. Nutritional information per serving (1/2 cup): 163 calories, 18 percent fat (3 grams), 70 percent carbohydrate, 12 percent protein, 42 milligrams calcium, 1 milligram iron, 8 micrograms folic acid. Old-Fashioned Rice Pudding Serves 8 A little bite of this rich and creamy pudding goes a long way. In a medium saucepan, bring water and rice to a boil. Reduce heat and simmer, partially covered, for 15 minutes (rice will be slightly wet). Heat oven to 325°. Lightly coat a 2-quart casserole with cooking spray. Whisk together egg whites and evaporated milk in a bowl. Blend in remaining ingredients. Add rice. Pour into prepared casserole and bake for 50 minutes, or until pudding barely wobbles in center. Let rest 10 minutes before serving. Nutritional information per serving (1/2 cup): 166 calories, 1 percent fat (.2 grams), 85 percent carbohydrate, 14 percent protein, 144 milligrams calcium, .8 milligrams iron, 6 micrograms folic acid.